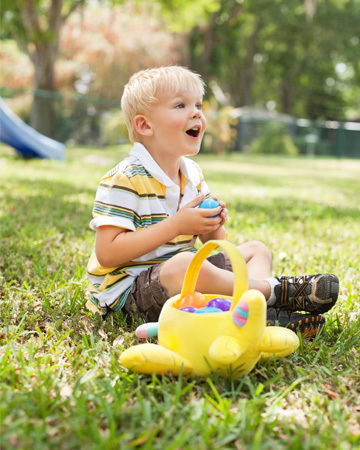 Before you stock up on chocolate eggs and jelly beans, try thinking outside the Easter basket. Here’s a list of great alternatives to candy that will make your kids forget about chocolate on Easter morning. If you are planning your annual trip to the store to stock up on bag after bag of sugary treats for Easter baskets this year, you might want to think twice before you buy. There are all kinds of ways fill up Easter baskets with fun and healthy treats rather than sugary snacks. We’ve gathered some of our favorite ideas that are sure to bring a smile to your little one’s face on Easter morning. There are all kinds of snacks you can substitute for candy, from mini packs of crackers to granola bars to homemade treats like these Magic Oatmeal Muffins from Two Cannoli. Sheets of stickers are always a hit, whether you stand them up in the basket or roll them up in plastic Easter eggs for a fun surprise that’s one more thing to keep your kids’ hands busy. This can be anything from crayons to coloring books to fingerpaint (if you are feeling brave). They make a perfect addition to any basket and keep the kids busy for much longer than a bag of jelly beans does. Whether you try this fun recipe to make your own or you buy it, your kids will love a few mini-containers of dough to play with. You could even add some cookie cutters and rollers to give them all the supplies they need to start creating. Small, inexpensive toys like bubbles, bouncy balls, chalk or water toys are easy to find at any dollar store and bring lots of fun. Tiny toys that might even fit into Easter eggs, like Matchbox cars, Legos, beads or marbles, will be just as much fun to open as they are to play with on Easter Day. Make your own Easter-themed tickets good for just about anything you can think up: dinner with Mom, get-out-of-chore-free card, stay up late, trip to the movies… the possibilities are endless.